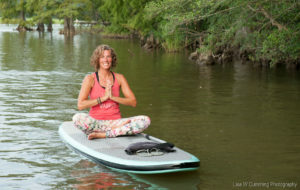 Paddle Yoga is a great way to take your practice outside to a floating mat and connect your body, mind and spirit with nature! Imagine floating on a paddleboard feeling the setting sun warm you from the inside out, listening to natures music and feeling the gentle rocking of the paddleboard as it moves you into calmness! Paddle Yoga allows you to slow down your pace and gain more focus on your practice as you move through each asana, it increases your attention to every breath and body movement, every placement of a foot, hand, leg, or arm is key to keeping your balance and bringing your attention to that moment. Simple yoga poses such as cat/cow, downward dog, mountain pose and child’s pose , just to name a few, practiced on a paddleboard are a great way to work on your focus, balance and breath skills.